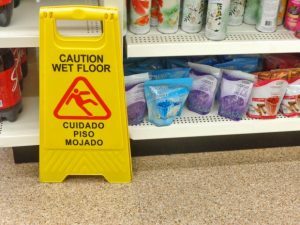 A Florida appellate court recently affirmed summary judgment favoring warehouse giant Costco in a slip-and-fall lawsuit filed by a woman who broke her knee after falling inside a Miami store. The primary reason the case failed was because, the court held, plaintiff had not produced evidence indicating that store staffers had knowledge of the liquid substance on its entrance way floor. 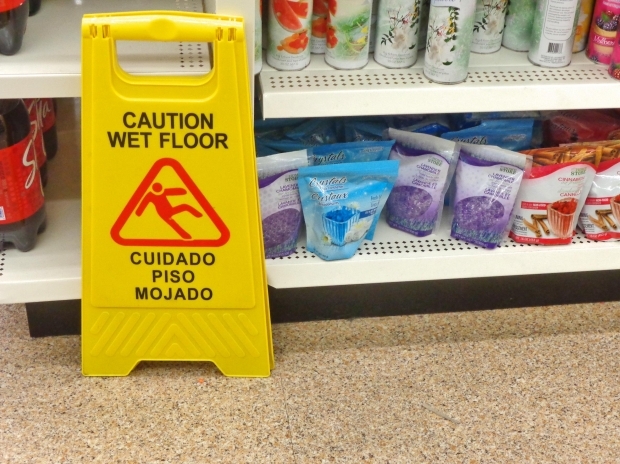 The element of a store owner’s knowledge regarding a slippery substance on the floor is outlined specifically in F.S. 768.0755. This provision requires plaintiffs in Florida slip-and-fall cases to prove either actual or constructive knowledge on the part of the defendant. Actual knowledge would be if a store staffer created the condition or if they had been informed about it directly. Constructive knowledge is a little trickier, but can be established with circumstantial evidence that shows the condition listed long enough the store should have discovered it in using ordinary care or that the condition occurred with regularity and was therefore foreseeable. In this case, according to Florida’s Third District Court of Appeals, plaintiff accompanied a neighbor to Costco, a store to which she had never been. When they got there, plaintiff’s neighbor went to get a shopping cart and plaintiff began walking toward the entrance. As she walked, she felt her right leg go out from underneath her, and she fell onto her left knee – breaking it. Plaintiff sued Costco for her injuries, alleging she fell on a slippery substance and it was Costco’s duty as a business owner to ensure nothing on the floor could cause invitees like her to get hurt. Costco filed for summary judgment, arguing there was no genuine issue of material fact as to the company’s actual or constructive knowledge of the slippery substance at the store’s front doors. The trial court granted that motion. On appeal, plaintiff argued firstly that the trial judge offered no elaboration on why the motion was granted and secondly, that the motion shouldn’t have been granted when based solely on plaintiff’s own testimony. Plaintiff suffered damages as a result of the breach. Typically, businesses in Florida have the duty to take ordinary and reasonable care to keep the property reasonably safe for invitees and to warn of dangers that the owner knew or should have known that weren’t obvious or discoverable to invitees. When it comes to slip-and-fall cases, F.S. 768.0755 modifies these duties to shift the burden of proof in constructive knowledge negligence cases fully onto the plaintiff (as noted in the appellate court’s 2017 ruling in Encarnacion v. Lifemark Hosps. of Fla. So here, Costco only needed to show there was no genuine dispute about its actual or constructive knowledge of slippery liquid on the floor. The appellate court noted it had granted summary judgment for business establishments in similar slip-and-fall cases on the same grounds. In this case, there was evidence presented that Costco had actual knowledge. Plaintiff never saw a Costco worker around the liquid or by the entrance before or when she fell down. As to constructive notice, plaintiff testified it wasn’t raining, she didn’t see liquid on the floor prior to the fall, she didn’t know what the liquid was or how long it had been there and she saw no one else slip in the same entrance before. Although many people assume trip-and-fall cases are pretty straightforward, the truth of the matter is they can quickly get fairly complex. If you have questions about injury cased by a Fort Myers slip-and-fall, our legal team can help.